Ever since Ray Bradbury’s death earlier this year, I’ve been meaning to read one of his books that I’d never read before. Since I’d only read four of his books before this, I had a lot to choose from. 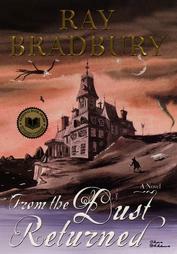 But I never got around to getting one from the library until last week, when I spotted “From the Dust Returned” on a display of Halloween books. I’d been in the mood for something gently spooky to celebrate the holiday, and I thought Bradbury might fit my tastes well, since I’d enjoyed the other books of his I’d read. I was right. When I say ‘gently spooky,’ I do mean gently — I can’t really handle anything scarier than “Buffy the Vampire Slayer.” I have a strong imagination, and horrific images can haunt my brain for years, so I take care what I read and watch. So you can believe me when I say that this is not a scary book. It’s not even particularly creepy, though all but one of the main characters are ghosts or vampires or other supernatural creatures. Instead, it is poignant and pensive, more concerned with raising your eyebrows than your hair. The book revolves around a giant house that is home to The Family, a collection of not-dead-anymore persons. It is also home to one human boy, Timothy, adopted by the Family as a baby when they found him on their doorstep. As he grows older, it becomes Timothy’s task to write down the history and wisdom of The Family’s members. This book is really a collection of short stories held loosely together by the framework of Timothy learning his family’s background. Bradbury wrote the stories over a period of fifty years, and quite a few of them had been previously published in various magazines. As usual, what I like best about Bradbury is the way he uses unusual characters and fantastical events to speak about very real and concrete themes. Among other things, this book explores the nature of family, the various ways two beings can relate to each other, and the many different types of love that exist in this world. But I would say it mostly deals with the way the modern world of gadgets and speed has replaced the old ways of life that had more room for thought and imagination. If you’re looking for a short story to read aloud on Halloween — to a group of kids around a camp fire, for instance — you’ll find plenty of possibilities here.